Since announcing the fall release of Center for Hispanic Leadership’s latest publication in its ebook series, the organization has been flooded with requests for advanced copies. Due to the high demand and to commemorate Hispanic Heritage Month, the Center will release Awakening the Latino Factor: Our Hidden Power to Earn Success and Transform America on September 16 – sooner than originally scheduled. This new ebook is a call to action for Hispanics in the U.S. It’s time for U.S. Hispanics to fulfill its role as the nation’s most valuable untapped resource." According to CHL, in order to change the current context and conversation about U.S. Hispanics from misrepresented stereotypes to catalysts for growth, the business world needs to think of Hispanics and their immigrant perspective as a powerful source to help America that will strengthen global competitiveness, prepare organizations for global market expansions, and create new products and services. “Glenn’s vision to empower and expand the influence of the Hispanic community as an economic development force in America is both innovative and ahead of its time. He will serve as an important voice that will transition the identity of Hispanics into the new mainstream,” explains Kelly Wright, co-host on Fox News – America’s News Headquarters. The ebook, which also features special bonus content including Hispanic strategy and marketing blogs, Hispanic resource links, and new Hispanic online training products, will be available on September 16 for download for $12.99. 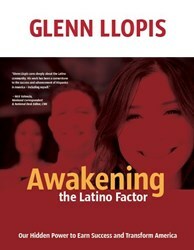 To receive further up-to-date notifications on the upcoming release please a visit: http://www.awakenlatinofactor.com. We build brands from the outside in. Instead of selling to Hispanic consumers, let them help build your brand and enable them to influence its growth. We develop Hispanic leaders from the inside out. By embracing their unique immigrant perspective instead of assimilating so quickly, Hispanic employees are enabled to innovate and lead your business with cultural authenticity.